Create an account | Forgot Username/Password? Having technical issues with our site? A Vanguard representative will be in contact with you shortly. VANGUARD CORPORATE USA - LONG BEACH, CA – Vanguard Logistics Services – today announced that it joined SmartWay® Transport Partnership, an innovative collaboration between U.S. Environmental Protection Agency (EPA) and industry that provides a framework to assess the environment and energy efficiency of goods movement supply chains. Vanguard Logistics Services will contribute to the Partnership’s savings of 196.5 million barrels of oil, $27.8 billion in fuel costs and 94 million tons of air pollutants. This is equivalent to eliminating annual energy use in over 12 million homes. 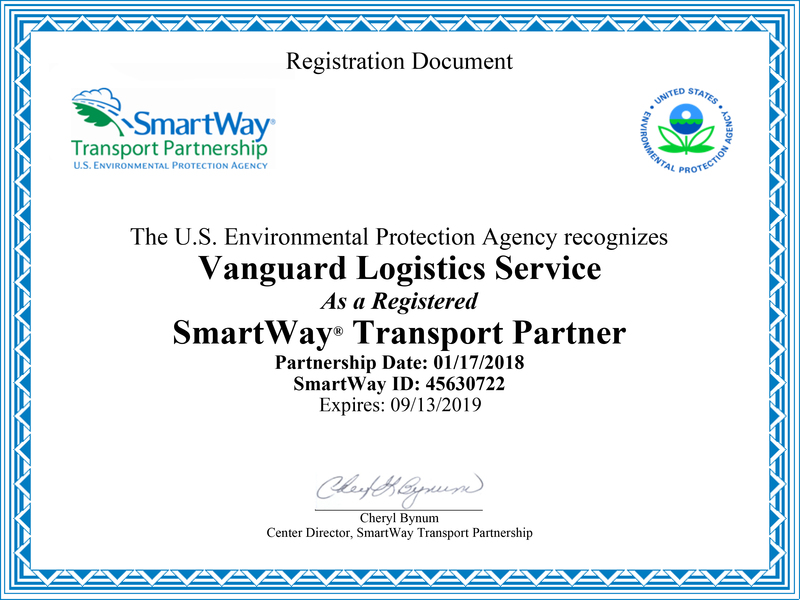 By joining SmartWay® Transport Partnership, Vanguard demonstrates its strong environmental leadership and corporate responsibility. ”We have always embraced efficient client solutions and reduction of our waste footprint through technology. By becoming a SmartWay® partner, Vanguard Logistics takes another leap forward as a responsible global corporate citizen” said Rob Sutton, Vice President of Logistics USA. Developed jointly in early 2003 by EPA and Charter Partners represented by industry stakeholders, environmental groups, American Trucking Associations, and Business for Social Responsibility, this innovative program was launched in 2004. Partners rely upon SmartWay® tools and approaches to track and reduce emissions and fuel use from goods movement. The Partnership currently has over 3,000 Partners including shipper, logistics companies, truck, rail, barge and multimodal carriers. Founded in 1978, Vanguard has been at the forefront of freight consolidators across the less than container load NVOCC landscape for nearly 40 years. Vanguard’s expansion to over 120 owned offices spread across nearly 35 countries, delivers unparalleled end-to-end service capability. Including trusted partners and agents this network expands our footprint to more than 100 countries. Vanguard’s owned network allows it to deliver the highest-performing, controlled, and compliant solutions to each step of its customers’ freight needs. Coupled with its range of value-added services, industry-leading information technology applications and more than 3,000 shipping experts, Vanguard has become a one-stop shop for many partners looking for speed, frequency, and control in the NVOCC market. For further information visit www.vanguardlogistics.com. For information about the SmartWay® Transport Partnership visit www.epa.gov/smartway. Vanguard India was deeply honored to receive the LCL Consolidator of the Year Award at the 2019 Multimodal Logistics Awards Conference held in New Delhi. Onno Meij joins Vanguard as Charlie Brennan Retires after 40+ years in the industry. Vanguard India receives prestigious award at the South East Cargo & Logistics Awards. Vanguard Logistics announces the opening of its own offices in Hanoi & Ho Chi Minh City, Vietnam effective September 5th, 2017. Vanguard's eFulfillment Connect solution integrates your international shipping and import needs direct to the distribution centers. Vanguard Acquires CHC Supply Chain Management enhancing services, control & solutions for customer shipping into and out of South Africa. Vanguard USA establishes a partnership with Delpa in Greece to extend its reach in the trade between the USA and South-East Europe. Vanguard Establishes Partnership with Africa Freight Systems to Extend Reach into East African Destinations. Vanguard establishes a partnership with Austromar in the Czech Republic to extend its reach in the trade between the USA and Central Europe. Vanguard Logistics Services has 117 Total Offices Worldwide: Bring us your cargo and we'll bring you the world! Vanguard Logistics Services Opens Warehouse in Hamburg, Germany. Get regular updates and promotions. has been sent to your inbox. VANGUARD LOGISTICS SERVICES provides ocean transportation to and from the United States and throughout the world as Vanguard Logistics Services (USA), Inc. dba Vanguard Logistics Services dba Vanguard dba Brennan International Transport dba Brennan dba Conterm Consolidation Services dba Conterm dba Direct Container Line dba DCL dba Ocean World Shipping dba OWS dba Ocean Express dba Oceanexpress (OTI# 017237N); or Vanguard Logistics Services (Hong Kong) Limited dba Vanguard Logistics Services dba Vanguard (OTI# 019927); or Vanguard Logistics Services (Japan) Limited dba Vanguard Logistics Services dba Vanguard (OTI# 021711). Delivering visibility, ease, speed and control – Vanguard customers can now manage their all of their business online with Adesso including quote activity, current and historical bookings, document management, and track and trace. All available through existing or easy to set up user accounts immediately online – for shipping to and from more than 20 countries. Whether your need is faster accurate quotes, managing quotes and downloading for your business, real time booking management or simply visibility of your shipping – Vanguard Adesso is the full life cycle platform for your Less than Container Load shipping needs.